Rumors of Washington’s plans to deploy 20 modernized nuclear bombs on German territory have provoked a sharp reaction from the Russian government, which has threatened to move tactical missiles and bombers closer to its western border. Russian experts believe the disagreement could lead to further tensions in Europe. The Kremlin has reacted harshly to the news that the U.S. may deploy 20 tactical nuclear bombs of the new B61-12 modification to the Luftwaffe airbase in Buchel, Western Germany. "This is another step, and a very serious step, unfortunately, towards increasing tensions on the European continent," said presidential press secretary Dmitry Peskov on Sept. 23. Certainly this can lead to a violation of the strategic balance in Europe, which is why it will of course demand corresponding countermeasures from Russia, measures that will restore parity," the RIA Novosti news agency quoted him as saying. In 2010 Germany’s government, the Bundestag, decided to insist on the removal of all American nuclear weapons from the country. However, they are still being stored at the Buchel base and the new plan basically calls for the modernization of this arsenal. 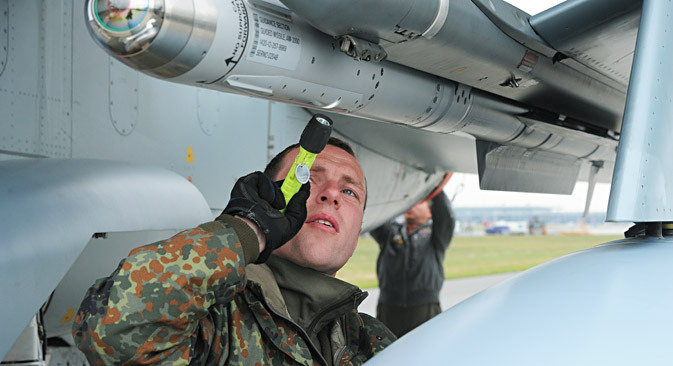 In the event of a war, German Tornado bombers can carry these bombs on NATO's command. The Russian mass media is reporting that as a response to America equipping German bombers with new nuclear bombs, Moscow is considering the possibility of sending its Iskander-M missile systems to the Kaliningrad Region. Chairman of the Council of the Russian Federation Committee on Defense and Security Viktor Ozerov stated that the deployment of new nuclear weapons in Germany may even result in Russia leaving the Intermediate-Range Nuclear Forces Treaty (INF). In an interview with Germany's ZDF TV channel, Russian Foreign Ministry Spokesperson Maria Zakharova said that Russia is concerned about the possibility of countries that do not have their own nuclear arsenal using the American weapons. "This is a violation of Articles 1 and 2 of the Nuclear Non-Proliferation Treaty," she said. However, the U.S. does not believe it is violating the non-proliferation agreement. Also, Shelley Laver, a spokeswoman for the National Nuclear Security Administration at the U.S. Department of Energy, hastened to declare that the production of the B61-12 bombs will not begin before 2020. According to Igor Korotchenko, director of the Center for World Weapons Trade and a member of the Public Council of the Russian Defense Ministry, in light of the tensions between Russia and the West, the deployment of modernized American nuclear weapons at the German base destabilizes the situation in Europe and may lead to the start of a new "Cold War." Korotchenko stressed that in the event of a war, the Buchel base will become an objective for Russian missiles and long-range aircraft. However, not all Russian experts believe that the Kremlin's nervous reaction is reasonable. In the opinion of Konstantin Sivkov, president of the Academy of Geopolitical Problems, Washington’s plans are not a surprise, since the tactical aviation modernization program of five non-nuclear NATO countries with the aim of enabling them to use nuclear weapons was accepted two years ago and will conclude in 2018. "The only thing Russia can respond with is re-equipping the Iskanders with nuclear warheads, producing a sufficient number of missiles for long-range strategic aviation and re-equipping and modernizing our Tu-22M3 planes," said Sivkov in an interview with RIA Novosti. Meanwhile, retired colonel and TASS news agency military observer Viktor Litovkin believes that Russia will not embark upon an arms race to counter America's plans to deploy new bombs at the Buchel base. In his words, Moscow will not make any pivotal moves in order to avoid "further weakening its economy."